Sometimes I get turned onto shows by my wife who is a much smarter creature than I, and for some reason she started watching Raising Hope early in its first season. I dismissed it out of hand because I didn't understand or appreciate the allure of creator Greg Garcia's last show (My Name Is Earl), and this one seemed a lot like it. However, I eventually capitulated and gave it a whirl and oddly enough, it might be the best show on Fox at the moment. The show's premise is intriguing, that's for sure. Jimmy (Lucas Neff), is out on an errand for his parents when he finds Lucy (Bijou Phillips, Choke) banging on his van window hoping to be rescued from an abusive boyfriend. Jimmy obliges and the two hook up in the van and outside his house. Jimmy wakes up the next morning to see Lucy at the breakfast table with her Mom, Virginia (Martha Plimpton, The Goonies) and Dad Burt (Garrett Dillahunt, No Country For Old Men). When Lucy steps away, the family finds out she is apparently wanted for murder, and Virginia subdues her by hitting her over the head with a television. Lucy is about to be executed for her crimes and meets Jimmy at her request, where he finds out she's pregnant with her baby. Upon Lucy's execution, Jimmy is given the baby, an adorable girl named Hope, to raise as his own. He raises her with the advice of his parents, who coincidentally had Jimmy when they were teenagers. The quartet also lives with/tolerates Maw Maw (Cloris Leachman, Young Frankenstein), the aging matriarch battling dementia in a comic manner. And thus, with Virginia's job as a maid for hire and Burt's job as a pool cleaner and landscaper combined with Jimmy's job at the local grocery store, hijinks commence. With the decidedly blue collar tint to the family's occupations, it was rather simplistic on my part to consider the show Garcia's sequel and continuing ode to white trash. But when you watch the pilot, there is a charming secondary story that advances through the course of the show's season. Burt and Virginia being in a similar situation that Jimmy finds himself in now (both had to raise a child when they were still teenagers), and their experience helps Jimmy dal with the stress, while they also get a chance to rediscover some moments of lost childhood. There is a cute moment during the first season when Burt and Jimmy are hanging out and Burt feels some conflict that Jimmy is more of a son and less of a buddy, which he's bothered by, and these times when Burt and Virginia find themselves growing in areas of adulthood they may not have realized before are charming and help make someone like me stay for the show. The show brings you in for the laughs, which it manages to deliver in Costco-like quantity. Neff is a relative unknown (to me at least) and his performance has a mix of naïve optimism and goofiness that is fascinating to watch, and I think he has a better than expected touch for physical comedy that is proficient. He is one part of this comic three-headed monster, with Dillahunt's turn as the slightly older and more oblivious playmate that happens to be his father makes for some hilarious turns. It may be an extension of his role in No Country For Old Men, but it works and is worth tuning in for. The surprise for me was Plimpton, who appears to not have aged a day since being in some recognizable films from the '80s. She plays Jimmy's mom with a strength and occasional touching moment of tenderness that tends to make you lose yourself in her character. It helps that her character tosses in two multi-syllabic words at once (like "procrasturbate") to reinforce her own place within the family redneck-edness. Sure, the show has its share of guest stars, and the Earl stars Jason Lee, Jaime Pressly and Ethan Suplee show up to fill the quota for the Garcia stock company, but the existing supporting cast has their own moments as well. Leachman handles the senile character of Maw Maw without abandon, and as Jimmy's love (or heavy like) interest Sabrina, Shannon Woodward (The Riches) looks like she came straight out of a Greg Mottola film, possessing a mix of beauty and intellect that makes her an instant crush. With other recurring cast members like Garfunkel and Oates' Kate Micucci, along with veteran actors Gregg Binkley (State of Play) and Tichina Arnold (Everybody Hates Chris), the cast as a whole brings the funny in a quiet but strong manner. 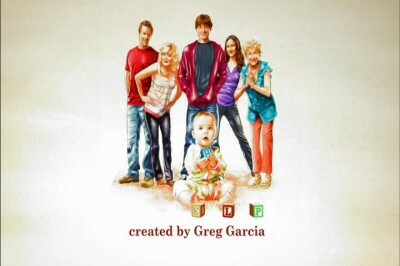 It felt good to get hooked into Raising Hope early because I think with the way the cast is set up, there is a potential to be a staple of programming for Fox for the next several seasons, something Garcia has had a knack for with his other shows. More importantly, it served as a good experience for me as a husband. See honey, I actually DO listen to you when you say something is good! Raising Hope is that, with a convincing layer of allure that makes for enjoyable viewing. Season One of Raising Hope includes 24 episodes spread out over three discs, and all of the episodes are presented in 1.78:1 anamorphic widescreen, and the results are solid. Filmed in high definition, the standard definition discs are nothing to sneeze at. Flesh tones are accurate and blacks are pretty strong without crushing, yet they manage to pull off the red in Dillahunt's many Washington Capitals shirts without saturation issues. There was no noticeable edge enhancement or image haloing that could have been a distraction, and the overall result is fine viewing material. Dolby Digital 5.1 surround for each and every episode. The soundtrack is a little more active than I was expecting, with directional effects and channel panning in multiple episodes. While there was some flirting with low-end fidelity, the subwoofer never engaged. Minor grievance aside, the comedy isn't going to be confused with demo material to begin with, and handles songs and ambient noises effectively. A very nice listening experience over all discs. There is something about the supplements within the set that leaves you a bit hollow when you're done, like there should be more here. Disc One has a commentary on the pilot with Garcia, Neff, Dillahunt and Plimpton, and they discuss what they liked and didn't on the episodes. There are lots of goofing around and not a lot of recall on the production itself. As a result the track is hardly a mindblower. The only other extra on the disc is the unaired pilot (22:20), notable in that Micucci portrays the role of Jimmy's cousin, but past that, you're not missing anything. The other extras can be found on the third disc, starting with an extended cut of "Don't Vote For This Episode" (26:00), a.k.a. the season finale. With the added four and a half minutes there is more room for the jokes stretch out and it's nice, but hardly mind blowing. Next is "Adorable Stars" (6:26), which looks at the twin children who portray Hope. Featuring interviews with the children's mother and the cast and crew, there are tons of shots of cute baby mugging that help show some people why the show works as it does. Next is "Moments with Mrs. Chance" (4:31), which is a similar looking piece to the previous one, just focusing more on Plimpton's lines in the show. "Taking Chances" (11:29) is the closest thing to a making-of featurette on the disc, as Garcia and the cast talk about shooting the finale and share their thoughts on one another and on the show, along with how Garcia works as a show runner and director. The gag reel (5:41) isn't too shabby, while the deleted and extended scenes (21, 19:40) shows us some interesting elements that were excised, including something which actually became the season's cliffhanger. I don't know whether or not Raising Hope is better than My Name Is Earl, but for a first season this is worthy enough to laugh violently while marveling at the smaller moments. Technically it's fine, though it lacks a bit on the bonus side of things, but with the second season in its infancy, the first is absolutely worth checking out.